As many prepare to celebrate this weekend with backyard fireworks displays, the CPSC has offered some great tips to keep your family safe. A new CPSC study indicates that in 2009 there were two deaths and nearly 9,000 emergency room visits for injuries resulting from fireworks related incidents. Most fireworks injuries occurred to consumers younger than 20 and resulted in the loss of a limb in many cases. In a press event, Chairman Inez Tenenbaum announced that during the 30 days surrounding last year’s Independence Day holiday, there were nearly 6,000 reports of injuries involving fireworks. Burns and lacerations to the hands, the face and the head were the most frequently reported injuries. More than half of the injuries during this time period were related to firecrackers, bottle rockets, and sparklers. Adults should always supervise fireworks activities. 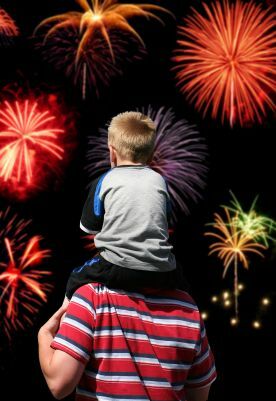 Parents often don’t realize that there are many injuries from sparklers to children under five. Sparklers burn at temperatures of about 2,000 degrees – hot enough to melt some metals. ilovegorgeous Creates Special Occasion Dresses with Ribbons and Silk!